E.S. Hamby, Y.-C. Juan, and P.T. 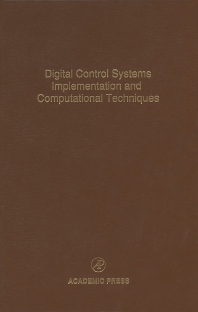 Kabamba, Optimal Hold Functions for Digital Control Systems. G.-Q. Xing and P.M. Bainum, Actuator Placement Using Degree of Controllability for Discrete-Time Systems. Z. Gao, Techniques in Reconfigurable Control System Design. T.T. Hartley, R.J. Veillette, and G. Cook, Techniques in Deadbeat and One-Step-Ahead Control. A. Garcia and M. Hubbard, Discrete-Time LQR Techniques in the Control of Modern Canals. J.P. Barbot, M. Djemai, S. Monaco, and D. Normand-Cyrot, Analysis and Control of Nonlinear Singularly Perturbed Systems under Sampling. M. Jamshidi, CAD Techniques in Control Systems. G. Casalino, A. Ferrara, R. Minciardi, and T. Parisini, Implicit Model Techniques and Their Application to LQ Adaptive Control. Subject Index. Electrical engineers in digital signal processing.